After a career as an international journalist, Rick Black has found beauty and solace in poetry book publishing and art. Black, of Arlington, VA, a book artist and poet, is the founder of Turtle Light Press. Over the past few years, Rick has dedicated himself to learning the bookmaking trade so that he can combine his love of words and stories with his desire to work with his hands. Rick has studied various facets of bookbinding, and in 2003, he was awarded one of eight emerging writer awards to attend an intensive letterpress printing seminar at The Center For Book Arts in New York. His 20-plus years as a journalist included a three-year stint in the Jerusalem Bureau of The New York Times. He has also freelanced for numerous publications, including The New York Times, The Los Angeles Times, The Boston Globe, The Chicago Tribune, The Dallas Morning News, The Jerusalem Post, The Forward, and Archeology. 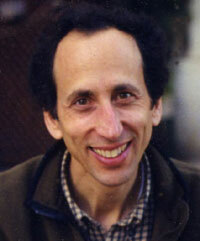 Rick has been a haiku poet for the past 10 years and has garnered several international awards. These include: First Place in the James W. Hackett Award, sponsored by The British Haiku Society, and Third Place in the Betty Drevniok Competition, sponsored by Haiku Canada. His haiku have appeared in journals including: Frogpond, Cricket, Cicada, RawNervz, Blithe Spirit, and Still. Peace and War is his first haiku chapbook. Rick balances his work at TLP by gardening, reading, and spending time with his wife, Laura Ahearn, and their daughter, Melanie. 1) Tell us about your educational background. I graduated from New York University in 1979 as a Classical Greek and Roman Literature major and got a post-graduate scholarship to study Hebrew literature at The Hebrew University in Jerusalem. However, I really learned to write through being a journalist, first on a small daily in New Jersey, and then in the Jerusalem bureau of The New York Times where I had some great editors. 2) How and when did you become interested in creative writing, art, and bookbinding? I became interested in writing when I needed to make sense of the death of my mother in my sophomore year of college. I tried to write short stories, novels, and other things, but none of them clicked until I turned to poetry and haiku in particular. My sumi-e painting was a natural outgrowth of my interest in haiku, and I pursued my studies with a Japanese art teacher in Greenwich Village. Once a week, I used to take the train into Penn Station, then a subway, and walk the rest of the way to her small studio. Her cat would walk gingerly between the black felt blotters beneath each of our rice paper drawings – there were about five or six of us. She would place her hand over mine so that I would get a feel for the brush and how to make the strokes properly. She really taught me a lot. “You have to go through walls,” she would say. “I have gone through a lot of walls in my art.” She is still teaching as far as I know – the Koho School of Sumi-e.
As far as hand bookbinding, that came completely by chance. One day I was returning home, walking down 27th Street in New York City, when I looked up and saw a huge banner for the Center for Book Arts. I had never heard of the Center before, so I went upstairs to take a peek and fell in love with the huge guillotine paper cutters, old-fashioned book presses, and Vandercook printing presses. In a small gallery, they had some exquisite poetry broadsheets and handmade books. That’s when I started taking classes there. 3) What do you find challenging about each of these? I love the challenge of trying to convey in the least possible number of words or brushstrokes the essence of an image. I like testing my own limits, experimenting, pushing myself. It’s like cross-country running, which I did in high school. I believe that beauty is a form of solace. This is the way that I try to give back to others, to share what I have to give from inside myself, whether that be a poem, a painting or a book. 4) When did you found Turtle Light Press, and what is the significance of its name? I founded Turtle Light Press in 2005 and coined the name from a wedding gift that we got from my wife’s godfather. When we opened up the package, we weren’t quite sure what it was, but it turned out to a beautiful turtle nightlight. We set it up and gradually grew quite fond of it. When it came time to pick a name for the press, I thought of that nightlight – a turtle being emblematic of our need to slow down, to savor each moment, and to cherish the light within each of us. 5) What goals do you have for your press? In all of our projects, TLP tries to produce a harmony of images and text so as to create an aesthetically pleasing book that is also deeply moving. As I have said, I believe that beauty is a form of solace, and all of our items, whether a book, a fine art print or a note card, reflect this to some degree. We will continue to focus on poetry and haiku books – these are the areas that mean the most to me. But I would like to get into making more affordable popular books, too. For example, we just completed our first trade paperback – the Nick Virgilio book – and hope to soon make some e-books, too. At the same time, TLP will continue to make limited editions and experiment with combining poems and images in broadsheets, prints and note cards. I’m excited about our next project – a limited edition of Yehuda Amichai poems. He wrote highly accessible poems about what it means to live in Israel. Entitled “The Amichai Windows,” the book plays on the idea of a poet looking out the window and being an outsider, not to mention the Jew as an outsider to history. A lot of the original manuscripts of the poems will be used to give the book an intimate feel, and the poems will be printed in both Hebrew and English on fine paper. Perhaps paper cuts will be incorporated into the design, too. 6) Tell us about the chapbook you’ve authored, Peace and War: A Collection of Haiku From Israel. I wrote this chapbook after three years of intensive reporting on the first Palestinian intifada and the first Persian Gulf War. Editors want to know what happened and the usual who, what, when, where, why and how of a story. But they’re not particularly interested in olive trees that might have just gotten blown up in a suicide bombing – and are still blossoming. And for me, the bloody images following a bombing and the olive trees were integrally linked, but I couldn’t write about them all within the parameters of the newspaper trade. So, when I got back to the States, I was looking for a way to capture what I had seen and a lot of the emotions that I had experienced over the course of three years of covering a lot of bloodshed and violence. And that’s when I discovered haiku, those tiny, imagistic poems that convey so much more than they would seem able to do. When I returned to Israel with my wife, Laura, I suddenly had a way to write about all of the things that I had always wanted to, but not been allowed to. I saw haiku all around and jotted down tons of images. When we returned to our home in South Carolina, I reviewed the haiku and intimations of haiku, crafting them into finished poems. I really didn’t care if my poems adhered to a modern English definition of haiku, or followed a 5-7-5 syllable count. Most of all, I wanted my poems to have an emotional depth that would move people and that just might be able to forward the cause of peace in the Middle East by increasing understanding and awareness of what was happening over there – and the price that is being paid. 7) Please give us a few samples of your haiku from Peace and War. 8) Tell us about the book you’ve published about Nick Virgilio, who he was, and why you chose to publish this book. Nick Virgilio was one of the best haiku poets this country has ever produced. I first came across his work when I returned to the States after being a reporter in Israel in 1992. Back then, my brother gave me a copy of The Haiku Handbook by William J. Higginson and Harold Henderson’s masterful thin volume, Haiku in English. I discovered Nick’s work in those volumes and got a copy of his 1988 classic, Selected Haiku. Entitled Nick Virgilio: A Life in Haiku, the book contains 100 previously unpublished poems and 30 old favorites. I wanted it to have an informal feel and to give people a sense of who Nick was and what his life was like so that they could understand the context of his poetry, and perhaps appreciate it even more. I decided to include some essays of Nick’s on the craft of haiku and an interview that he did on WHYY Radio in which he discusses his love of haiku and what it means to him. I also included a tribute to him by his good friend Michael Doyle, pictures of Nick and his family, and some facsimiles of the original manuscripts. What was it about Virgilio’s poems that attracted me? Their depth of feeling, I suppose – not only those about his youngest brother, Larry, who was killed in Vietnam, but others about his family, the people of Camden, NJ, and nature. I particularly liked the way in which he integrated people and nature into his work. I never dreamed that one day I would become acquainted with his sole surviving brother, Tony, or that I would publish a volume of his haiku. While I never met Nick myself, he was essentially my teacher and an inspiration. He provided a way for me to write about what I had encountered in Israel. So, it was with a feeling of awe that I first opened up the cabinets of the archive at Rutgers University, glimpsed poems that few others had ever seen, and decided to do a new book. It has already gotten a great review by Lorin Ford, and many people have expressed their thanks and suggested that it is an important contribution to haiku literature. 9) Can you give us a few samples of Virgilio’s haiku? 10) You teach writing. Have you always wanted to teach? What are some of the types of workshops you’ve given? I have not always wanted to teach but I enjoy it a lot. It’s fun because I can guide people along, and there’s a lot of interaction between participants and myself. I have done workshops for both adults and teens. So far, I have given bookmaking, memoir writing, and haiku workshops. One time, I ran a two-day workshop in which everyone learned to write haiku and to make an accordion book of their poems. It’s great to be able to help people learn to do things that they haven’t done before – or to see the world in a new way. 11) What is your website address, and how may people get in touch with you? This entry was posted in Art, Artists, Authors, Book Publishing, Books, Creativity, Haiku, Japanese Style Poetry, Journalism, Journalists, Newspaper Writers, Nick Virgilio, Poetry, Poetry Books, Short Poetry, sumi-e, Writing and tagged Beginning Writers, Book Writers, Creative Writers, Haiku, Journalism, Journalists, Poetry, Poets, Short Poems, Writing for Newspapers, Writing for Publication, www.haikuproject.wordpress.com, www.tobaccoroadpoet.blogspot.com. Bookmark the permalink. Hi, Charlotte, Thanks so much for Rick’s interview. I have never seen such lovely books as he creates…the whole of the art behind it’s creation blooms in your hands as you read the haiku. I’m thankful for this interview with him to get a glimpse into his own experiences in Israel….a time that few people understand yet we hope for a lasting peace in that region in spite of the seeming impossibility of the situation. While I have been lapse in purchasing the Virgilio volume (life happens) I was thrilled to hear of his find and willingness to bring these haiku into public view and give them life again. Rick’s sensitivity as an artist can’t be overstated. It resonates in everything he does. Thanks for writing, Merrill! I’ll make sure Rick gets your comments. I wish the economy were a little better. His work is lovely … sending along my best wishes…. Rick does important work furthering the arts. So do you, Merrill! Yes, I prefer holding a book, rather than reading on a screen.